Staley Signs, Inc. has had the pleasure of relationships with a wide variety of clients. We take pride in our list of repeat customers, some of which have been with us for up to three generations. While others are coming aboard every day. Staley Signs, Inc. invites you to look through our portfolio. Each section has a "case study" of a particular project. This will give you a little more detail about the special features, goals and challenges of that project. These projects are simply a sampling of what Staley Signs, Inc. can do. We look forward to working with you on similar or other unique sign projects. Staley Signs, Inc. works with many clients on a repeat or continual basis. Our relationship with the Indianapolis Star is a great example. After many years of using a time & temperature display on their projecting sign, they were ready for an upgrade. Media and advertising is becoming more and more technology driven, so it was very natural for The Star to incorporate a full color electronic message display into their existing sign. The scope of the project was fairly extensive. Staley Signs, Inc. repainted the existing sign cabinet to match their new corporate colors; manufactured new translucent white faces for the channel letters, manufactured decorative end treatments; and most importantly furnished a new electronic message sign. The message sign is by Watchfire. It is the 19 mm (high resolution) with XVS model. The XVS upgrade allows the customer a wider viewing angle and more importantly, the ability to run live video feeds. The technology in this sign is among the best in Indianapolis. 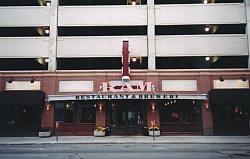 The Ram Restaurant and Brewery opened a new location in Indianapolis. It is in the former location of Planet Hollywood on Illinois Street. 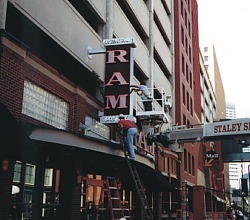 Staley Signs, Inc. worked closely with Ram International, based in Washington, to develop unique signage for the Indy location. The signage included a 12' tall, double-sided projecting sign, individual channel letters, non-illuminated aluminum plate letters, and interior vinyl. There are several unique features. The channel letters have perforated aluminum faces. Typical channel letters have either plexiglass faces or are open faced. The perforated faces add a "new millennium" style. At the top and bottom of the projecting sign is exposed neon lettering that reads "Restaurant" and "Brewery". This brings in the classic signdesigns of the 1950s. The combination of the new facade and signage resulted in one of Indianapolis's most appealing restaurant "store fronts." 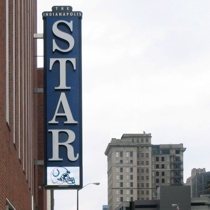 The Star is the major Indianapolis Newspaper, who contracted Staley Signs, Inc. to manufacture and install a new sign at their offices on Pennsylvania St. in Indianapolis. Blade or projecting signs have been an important element in Downtown signage. In an area densely populated with high rise buildings, blade signs offer viewing perspectives from two directions and the ability to go up with company identification instead of across. In addition, they have a very distinct and classic look. The Star blade sign has an overall height of 28'-8" tall by 6'-4" wide. The main body of the sign is a metal frame with aluminum faces. The Star letters are internally illuminated channel letters mounted to the sign cabinet. At the top of the sign is a double face cabinet with an opaque background and translucent copy that reads, "THE INDIANAPOLIS". At the bottom of the sign is an LED Time and Temperature display. The time is constantly being monitored by a link to a satellite monitoring system.